Iconic Valjoux 72 Reverse Panda manually wound Chronograph movement. The stainless steel case measures 36mm excluding the crown and pushers. The watch runs, keeps time and the chronograph functions are working properly. Overall Condition: Case is in very good condition overall with sharp lugs and typical signs of use and wear of a 50 year old tool watch. The original hands are all correct and the crown is signed. The original second execution dial is in excellent condition, under a loupe there are a few rub marks and spots consistent with its age. The lume on the dial and hands appears original. The original lume dots on the dials hour indices are original and mostly present- The hour plots at 6:00 and 9:00 are flattened but present, the 3:00 dot is mostly missing. The three sub dials have aged attractivly and appear brownish in daylight. Includes brown leather B&S Leather Strap shown in photos. 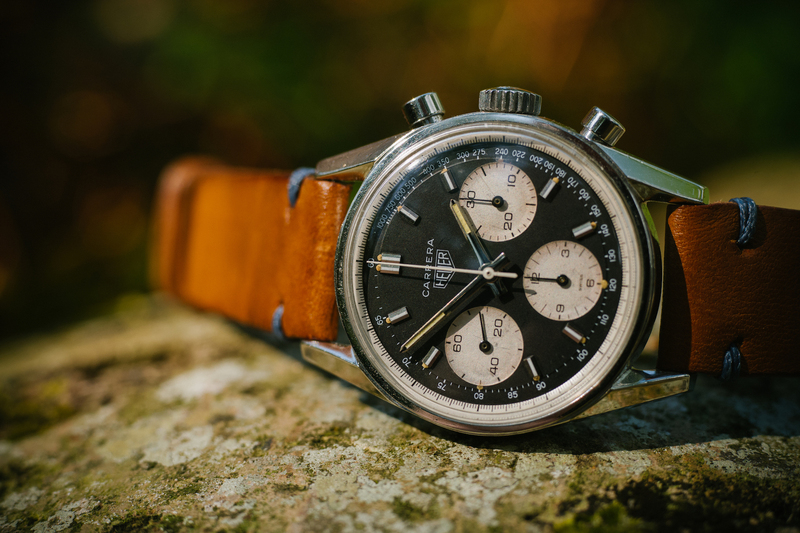 Overall its a very nice looking example of this classic Chronograph and looks great on the wrist. $13,500 includes insured shipping in the US. World wide shipping available at actual cost.